^ Quickfacts.census.gov - Taylor County - accessed 2011-12-06. 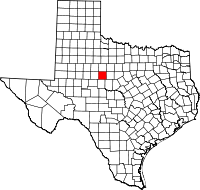 ^ Quickfacts.census.gov - Abilene, Texas Archived 2015年1月6日, at the Wayback Machine. - accessed 2011-12-06. ^ “Epileptic Colony Open”. The journal of the American Medical Association (American Medical Association) 41: 973. (1903). ^ Ebeling, Walter (1990). Fruited Plain: The Story of American Agriculture. Univ of California Pr. p. 249. ISBN 978-0-520-03751-9.